The starting point to finding the best washroom accessories for your commercial washrooms is to have a design in mind, and tailor your equipment to this. So what style should you opt for? For a modern and contemporary style, you may wish to opt for stainless steel bathroom accessories, including hand dryers, waste bins, paper and soap dispensers. On the other hand, a more simple and traditional style may suit ABS plastic accessories. The shape of the accessories you decide upon can also help you to achieve your desired look, with curves and smooth edges looking more modern, and sharp edges sticking to the traditional style. Whichever style you are going for, we are sure that we can provide you with the accessories to compliment your design. Although you will want your commercial washroom to appeal to everyone, it is still important to consider your audience. If your washroom is restricted for use of only your employees, you may just opt for less expensive options which meet people’s expectations. However, if you have a public washroom which can be used by everyone, including your customers, there may be more of a need to spend more on washroom accessories in order to exceed expectations. 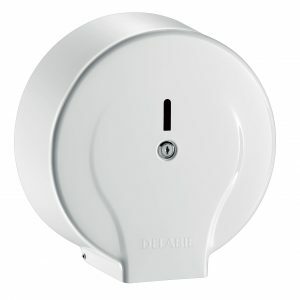 For example, if you are looking for a fairly basic and inexpensive option for your public washrooms, you may wish to opt for an Automatic Nozzle Hand Dryer, however if you really want to impress and give your visitors ease of use when using your facilities, you could choose an advanced technology hand dryer such as our High Powered 3G Hand Dryer, which looks much more impressive, is more hygienic and easier to use. Which washroom accessories do you need? It goes without saying that a toilet roll dispenser or holder is an essential accessory in any washroom, and we offer a range of different sizes with the option of Stainless Steel, White Steel and ABS Plastic – perfect for any commercial property. A hygienic waste bin is needed in all washrooms, and it is particularly important to have one in each cubical of a women’s washroom for disposal of sanitary towels and waste. 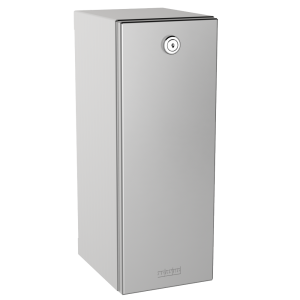 We offer a range of stainless steel waste bins which are hygienic and easy to clean, with options of floor or wall mounted. The perfect addition to a commercial washroom is quality hand dryers, as they are often much easier and more hygienic to use than towels and paper towels. 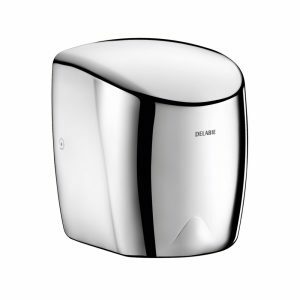 Our range extends from basic Automatic Nozzle Hand Dryers to Mini Jet Dryers and impressive High Powered 3G Hand Dryers. You can choose from a wide variety of different soap holders and dispensers, from basic soap dishes to wall mounted soft touch dispensers. Depending on who is going to be using your washroom, and your budget, you may decide upon different soap dispensers. If you are not having a hand dryer or paper towel dispenser in your washroom, or if you have showers as part of your facility, it is important to have a towel rail or hook. 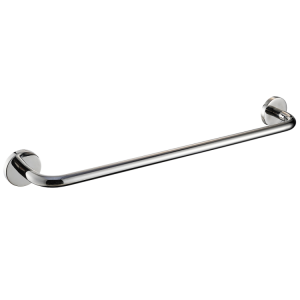 We offer a wide range of stainless steel towel rails and robe hooks for use in commercial washrooms. It is not always essential to have baby changing units in a public washroom, unless in a nursery or childcare facility, however if you are looking for washroom accessories for a public toilet there is a growing call for baby changing equipment, so you may wish to check out our range of changing units. Catering for everyone who is going to use your washroom is very important, and not just ethically – there are laws which state that you have to provide sufficient equipment for disabled users. Opting for a Doc M Pack is the best way to ensure that your disabled facilities are adequate for disabled users, as these have been checked to ensure that they meet UK Buildings regulations. The Doc M packs we provide offer a full range of disabled accessories which will maximise comfort for your disabled and elderly visitors and ensure that your facilities are easy for them to use, increasing health and safety in your workplace. For more information on what disabled washroom accessories you need to purchase, speak to one of our friendly team on 01157 842769. How tech savvy does your washroom need to be? Basic accessories are what add the finishing touch to your washroom and ensure that it is as easy and efficient as possible for your visitors to use, however you can take this a step further by including technology in your commercial washrooms. The addition of advanced technology can be an asset to any washroom, and can be a great way of modernising your space and making it easier for your visitors to use. A few of the technological products you could integrate into washroom include high powered hand dryers, automatic urinal flush controllers, washroom odour eliminators and no touch sensor taps, which are all a great way of exceeding expectations of your staff and giving a great first impression to your guests and potential customers. Here at The Sanitaryware Supplies Company, we supply a wide variety of accessories for public and commercial washrooms. Our extensive range of ABS plastic and stainless steel bathroom accessories includes toilet roll dispenser, waste bins, hand dryers, towel dispensers and soap dispensers. For more information on our range and which products are best for your purpose, get in contact with our friendly team on 01157 842769.